Gareth Bale is the Welsh midfielder of Real Madrid. He is best known for his ability to swerve free kicks, strike long balls, and swiftly go past through opponent defenders. He has been commended for his “tremendous speed, great crossing ability, a great left foot and exceptional physical qualities” that he shows off on the field. His career started in Southampton in 1999. Since then, he has been improving and making his mark in the football industry. The other teams he belonged in include Tottenham Hotspur, the national team of Wales U17, U19, U21, and Wales. He has also received recognition for his playing style. In 2013, he was named Player of the Year by PFA and was a part of the UEFA Team of the Year. Other recognition he received were FWA Footballer of the Year, PFA Young Player of the Year, and was a finalist for UEFA Best Player in Europe Award. His official jersey number is 11. Gareth Frank Bale was born on July 16, 1989, in Cardiff, Wales. He is the son of a school caretaker and an operations manager. 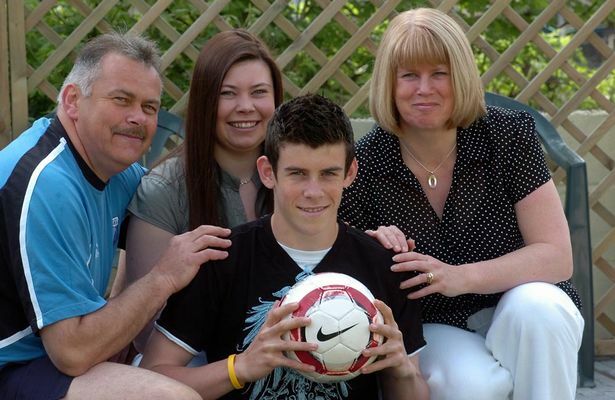 His father is Frank Bale while his mother’s name is Debbie Bale. His uncle is also a footballer who plays for Cardiff City, Chris Pike. He has one sister younger than him named Vicky. He studied at Whitchurch High School. He was very athletic in school, playing rugby and hockey on the side of his football activity. He made a sprint record of 11.4 seconds in the 100-meter dash. This resulted in a restriction of him using his left foot and playing one-touch football. Southampton has discovered his potentials and took him in to train in the satellite academy in Bath. He was only 14 years old when he started training for Southampton. By the time he turned 16, he has already helped his team win the Cardiff & Vale Senior Cup for the under-18 category. In summer 2005, he left school with a Grade A in PE along with the PE Department’s prize for services to sport. He joined Southampton officially and became its second youngest member in history. Gareth is in a relationship with his high school sweetheart Emma Rhys-Jones. They live together in Madrid with their children. Their first child was born on October 21, 2012, in University Hospital of Wales. She was named Alba Violet Bale. Their younger child was born on March 22, 2016. Three months after the birth of their daughter, July 17, 2016, and a day after his 27th birthday, Gareth has announced that he and Emma are engaged. He has endorsed multiple brands and was included in the EA Sports’ FIFA game series including FIFA 14’s British, Irish, and Middle Eastern release. Some of the brands that he supports are BT Sport, Adidas, Lucozade, and EA Sports itself. He is the first player to wear the Adidas F50 crazylight football boots in March 2014. All these promotions combined gives him an income of about $12 million annually on top of his yearly salary from Real Madrid that is put at $19 million.